This is a post about why – and how – we let our kids (3 and 5) spend up to three hours at a stretch playing with smart phones. I know! I totally shouldn’t admit that in public. Guidelines say no more than thirty to sixty minutes a day or they’ll grow up to be myopic, couch-dwelling drones, cut off from life and reality. What about poorly-developed social skills, lost learning opportunities, and their eyes, oh their eyes! But I’ve never liked curfews and I’ve never had one imposed upon me, and the idea that I’d set my kids a “screen curfew” just doesn’t gel. I am prepared to rethink my stance on curfews at the start of the undead apocalypse. Image by Alejandro Lunadei, via Wikimedia Commons. Of course, we’re not happy to let them roam (metaphorically) about the inter-webs til heaven-knows-when with heaven-knows who smoking heaven-knows what, either – any more than my parents used their anti-curfew policy to encourage the same in us. We always had to say where we’d be going, who’d we’d be going with, what we planned to do, and when we planned to return home, and they would either approve the plan wholesale (even if it meant getting home closer to midnight than 9pm), or send us away to revise it. The thing about not having a curfew, though, is instead of just setting a time limit (clear, simple and easy), you have to decide what you will and won’t approve (requires prolonged late-night arguments with your spouse and the eventual creation of blog posts and infographics). On the upside, I can now share with you this blog post, with infographics. I bet you can hardly believe your luck. We’ve all seen the healthy eating food pyramid. It’s got the stuff our bodies need most of on the bottom, and least of at the top. Typically (I realise there’s debate, but let me stick to what I learnt at primary school) the foundation is energy foods, because back in the day that’s what our bodies were mostly required to do – expend energy. And in fact, it’s still considered good for our bodies to get out there and work, whether we need to or not. The middle tier is all about building blocks like proteins, because our bodies’ next most important job is healing and growing. And way up the top is the junk food we can probably do without, only we don’t really want to. The old-fashioned food pyramid. Image by Nagagym, via Wikimedia Commons. We tried to base our Screen Pyramid on what our minds need the most of – not just intellectually, but also emotionally and socially. Our philosophy is that the mind, like the body, needs to work. 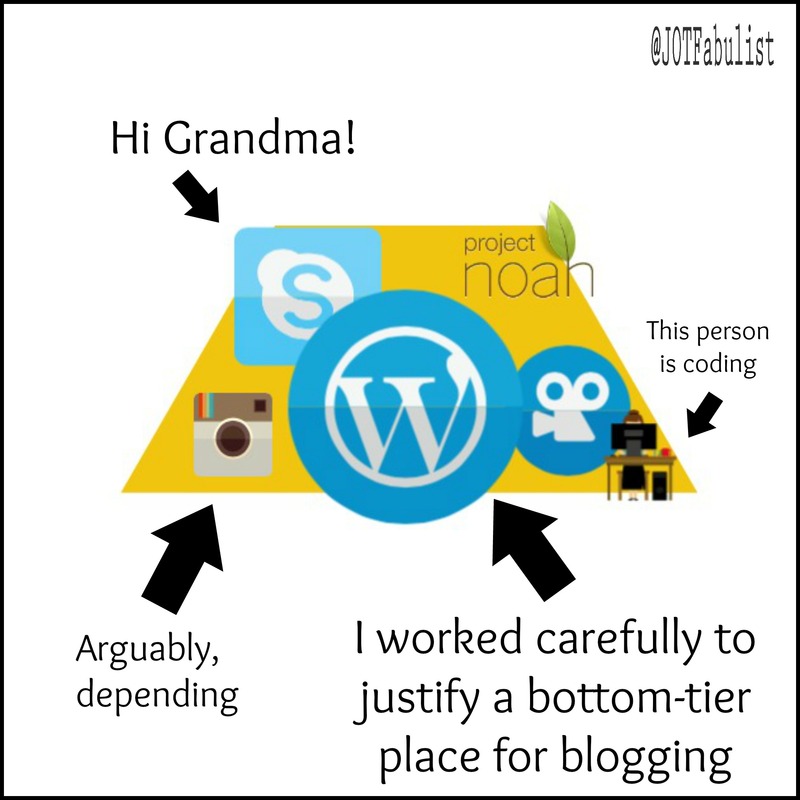 The bottom tier of our Screen Pyramid therefore focuses on creative production and “rich and sustained” social interaction – things like writing thoughtful blog posts, learning how to make infographics, or skyping Grandma (hi Grandma!). The second tier focuses on building blocks that help us improve our creative works and grow our social connections – reading good quality sources of information, using educational apps, or setting up play dates on facebook. 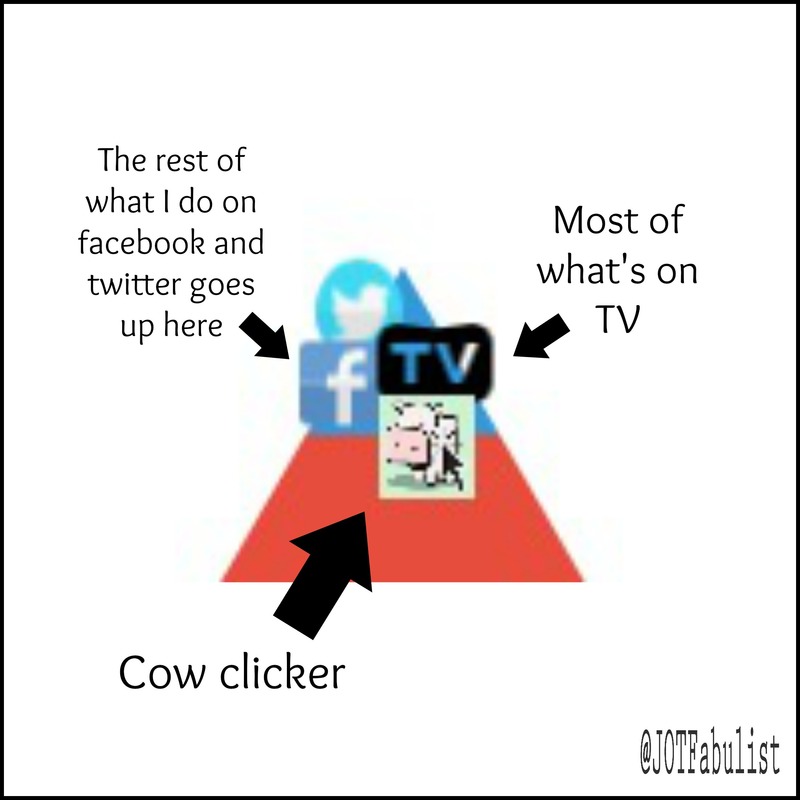 And the top tier focuses on Cow Clicker. 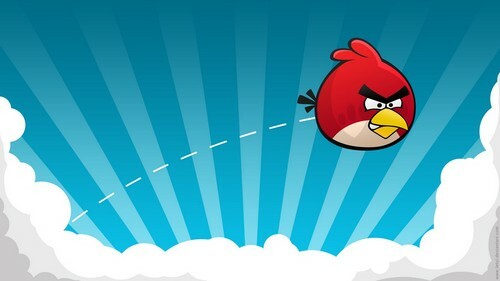 “Can I use your phone for just ten minutes to play a game which is not only pointless, but irritatingly noisy?” Answer: “As soon as we start serving boiled lollies for breakfast.” Image source. A big argument for shutting off the screen is the same one my husband uses when he flies all the way to New York for a business meeting: from a social perspective, there are some things even Skype can’t deliver (apart from, but apparently including, the ability to buy rounds at the bar). “Rich and sustained” social interaction tends to develop face to face. We all have our guilty secrets. I’ll pass up the opportunity to tell you mine in favour of pointing the finger at a former colleague who liked to keep his surgeries on schedule so he could sneak off and watch Coronation Street in his lunch hour. Am I going to swear off ice-cream forever? Not likely. The same goes for frivolous internet memes and strangely-addictive but ultimately-purposeless game apps. I mean it’s analogous, I haven’t literally tried to eat Candy Crush. Applying the healthy eating screen pyramid requires discretion and common sense – which is why I don’t do it in the morning, before coffee. We all know some fruits, veggies and cereals are dense in bioavailable nutrients, while others contain relatively scant amounts of stuff your body will mostly spit out. Likewise, you can slap up a blog post in ten minutes using only what you already know plus a blurry picture of your cat (although I don’t hate your cat), or you can research, edit and hone it for upwards of six hours per twelve hundred words and four pictures. One is obviously doing more for our minds than the other, even if they’re sort of the same thing. 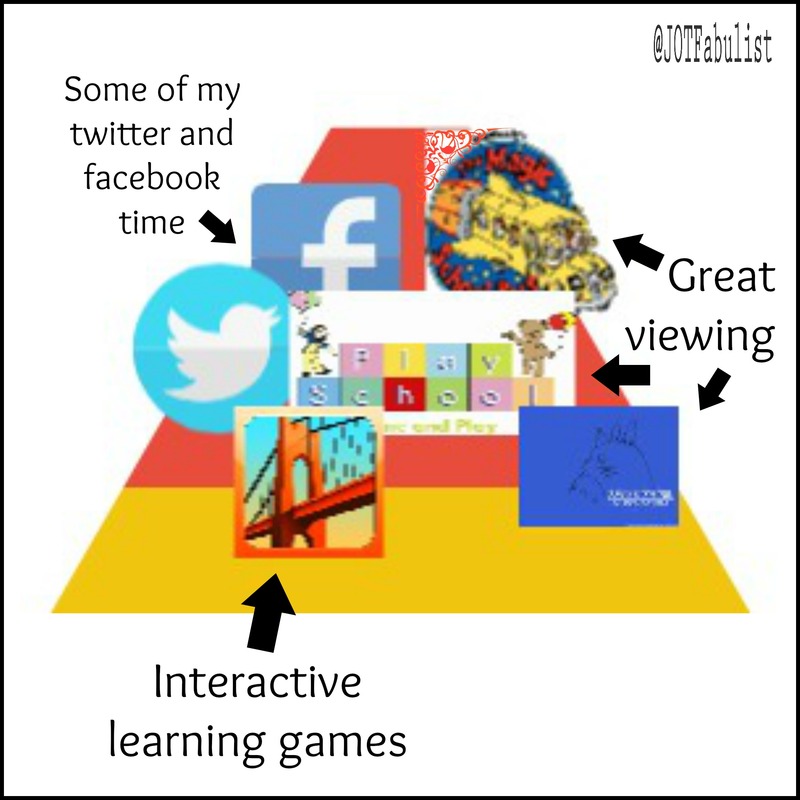 Also, just as you might need more protein than usual during a growth spurt or convalescence, we think our screen time consumption might not always look exactly like the pyramid, depending on what sort of input our brains need at a given stage of learning. Plus we shouldn’t eat food all day – even good food. Our bodies need only what they can use. Similarly, I can’t continue to be fully productive at my computer beyond a certain point, even if I am creating a prize-worthy piece. Which I’m probably not. Our TV stays off by default, our devices are all passcode-protected, and we tend to encourage small portions. 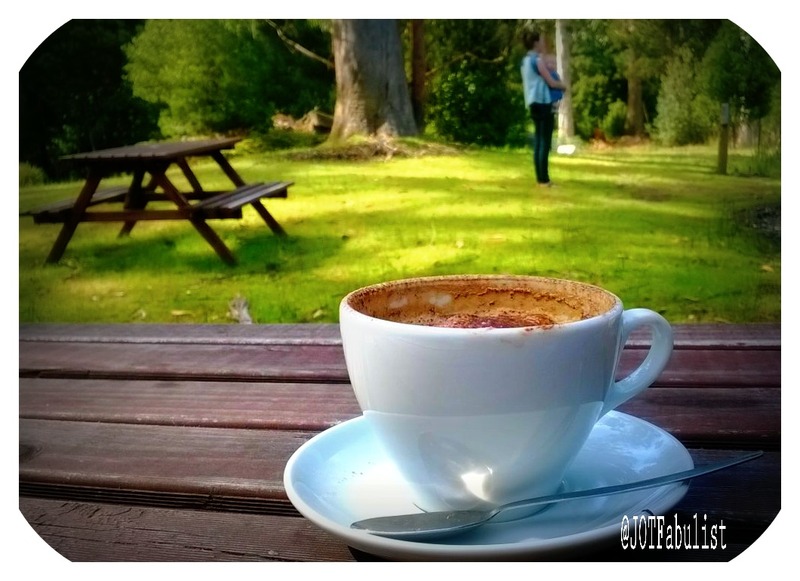 And again – just never ask before coffee. But Seriously, Three Hours At Once? What on earth, etc, etc. Here’s the story: they were working collaboratively (and harmoniously!) on a series of special FX home videos. They danced. They jumped. They ran around on the grass. They dressed up, created props, and drew sets. They directed each other and negotiated over differences of opinion. They participated in a lengthy discussion about marketing techniques and the true value of in-app purchases. They took turns and got along – after all, they didn’t want me reclaiming my phone. And interspersed with all that, they pointed the camera, and videoed, and played themselves back. I decided I was ok with it. And also the undead apocalypse – those skeletons know how to party. Paul Miller spent a whole year offline and learned that the problem with the internet is not with the internet. Over at The Educator’s Spin On It, Mia, Amanda and Kim show how screen time can boost non-screen-side skills and interests. Thereza has a post on how screen-based technology makes the distances shorter for those living far away. Julie of The Eyes Of My Eyes Are Opened describes how she tries to balance a policy of limited TV with allowing her kids to fit in (and without introducing too many dead cats or cannibals). Olga tries not to make screen time (sweets, or particular languages) too scarce, lest it cause conflicts and anxiety. She views technology as tool that, carefully used, can bring many advantages. In Cate’s house, they have Ten Commandments Of Screen Time And Technology Use. And the Spoonful Of Style household restricts screen use to certain times and days, to help reduce battles. And there is something in this, because, the battles. In truth, we have created some just-don’t-ask “screen curfews” as well. Portion sizes getting out of control? Ute lists five rules they use to reduce screen time at their home. The Educators Spin On It has a whole link-up dedicated to getting the kids to go screen-free for a week. Free But Fun posts often about all the things she does with her preschoolers – and not a screen in sight! Lisa suggests age-appropriate Family Contracts to guide discussions about online safety: one for kids, one for teens. The American Optometric Association has some guidelines for parents whose kids use computers. The post Screen Time: A Healthy Eating Pyramid appeared first at Journeys of the Fabulist, and it was totally bottom-tier stuff, all the way. It was featured in the 5th Technology Roundup at Monster’s Ed Homeschooling Academy. I teach students of 5 years and above, and many of the parents are then, at the stage of realising that too much TV and gadgets are becoming a problem. But this mostly is because technology has replaced play time and social interaction …. your 3 tier plan is really great – and quite do-able! I love technology, but I do think we have to take a step back and make sure it’s serving us, and not the other way around. Prioritising like this has helped assess our gadgets more critically and choose how to use them. I love how you question the norms & standards with extremely valid points, are bold enough to write what you did (there is no way you are in your first year of parenting! ), and really enjoy my first visit on your blog. I’ll be back!! Yes, it’s much harder to be bold when you’re starting out! Glad you found the points valid. There’s still a lot of room in there for finding your own balance, but we’re much happier approaching the question with this framework in mind. Creative, SmArt (pun off the phone) presentation, of CourSe. Love your graphics. Thanks! The graphics (as already mentioned) were a bit of a learning experience, so good to have your positive feedback. …for discussion on how screens might be affecting our minds and habits. I think it’s a critical consideration for postmodern parents with the ubiquity of gadgets and machines in our lives. Not to mention the EMF danger! I’ve been planning to do a post on the hazards of computer frequencies for months now. Fantastic and brilliant! Happy to share! Thanks – I was pleased with this one. You know, now I don’t feel so bad for letting the smartphone, tablet or PC baby sit my kids, LOL. Thanks for sharing your thoughts on the “issue”. Well, I assume you’re using your common sense and discretion about it! It was fun to link up and thanks for featuring me! I’ll grab the button now. 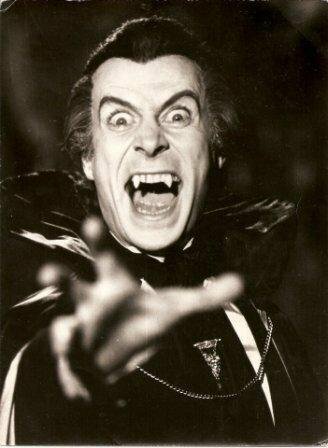 Well, maybe I should have said boiled lollies before bedtime. Now that’s never a good idea! Yes, I agree with you – a little something to keep life fun and interesting is ok, even if it isn’t “healthy”, but you have to keep the portions under control. Brilliant post! You should put these posts into an e-book, more practically useful than most books I have been recommended which are always full of crap to make feel crap 🙂 Great infographics. Well, so far I’ve only got the one info graphic, which would make a pretty thin e-book, but if I end up with (what?) twenty, I’ll keep your suggestion in mind 🙂 . Thanks for the vote of confidence, nice to see you back at the blogs! Sounds like a fun (and big) project. 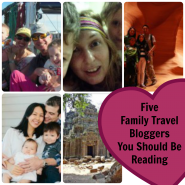 If you get time to blog about it, I’d love to hear more! I do know what you mean about being a blogger, though – it’s the type of hobby that really becomes part of you, and of course there’s the community you meet as well. Okay, I am very impressed with the infographics. And I like your take on screen time. I don’t have kids at this point so I mostly skim over the people who yell at each other for being bad parents, but this seems like a pretty reasonable approach. Whether or not you end up having kids, I would keep skimming over that. I like hearing what others are doing sometimes when I haven’t quite made up my own mind on something, but I prefer when people leave me to judge whether it’s a suitable approach for our house. Also, I hate shouting, and I can’t work out why people would get upset with other parents for (allegedly) turning their kids into unthinking drones who’ll probably one day be happy enough to do those unthinking drone jobs someone needs to do but none of us want to. Maybe I’ve read Brave New World one too many times, and wrongly. I love the way you compared this to the food pyramid. Clever! It made sense to us – I think it’s helped clarify our policy. The analogy seems to work very well so far. I also love the comparison with the healthy food pyramid. It is a question I grapple with with my own kids. So little is actually known about the effects of all this technology on the lives of little ones, and I do think the guidelines are too low and don’t really reflect the reality of the world we live in. They also do not reflect just how great and educational so many computer applications can be today. I also find it strange how so many schools are falling over themselves in the rush to embrace tablets and laptops into all parts of school (for example, we are meant to be making all work for year sevens to be on their laptops), but yet we are not meant to use them for preschoolers. That seems like a bit of a contradiction to me. Yeah, that seems a bit strange. Is there a developmental reason, e.g. when they’re at preschool age it’s the right age to acquire skill X (which can’t be got with computers) whereas when they’re at year seven it’s the right age to acquire skill Y (computers)? Because without that context it would seem a bit random. All work for year sevens on a laptop seems a lot either way, though! It’ll be interesting to see more study come out of this area – as you say, it’s all relatively new and we’re kind of experimenting blind in some ways. Ha! Ha! Good thing you managed to fit blogging into the biggest part. And writing code??? Also a Hahahha moment for me! 🙂 As a retired health teacher, loved the pyramid analogy. Ah, you’d be all over this sort of explanation. I bet you did the food pyramid a few times. Brilliantly written and your info thingies are fabulous. My 12 yr old was reading over my shoulder and said, we should have one of those pyramids mum. You did make me think though, we give the boys 30min of screen junk a day and then the rest of the time I expect them to be outside playing, however when I look at it they are outside playing but filming, making movies, then downloading the data, editing and turning them into little movies that are actually watchable. They are also allowed to have time to write stories on the computer and look up info etc…so really I am kidding myself when I say they only have 30 min a day of computer time and really I am OK with that because at least they are creating a fun environment for them to play in. I really enjoyed this post- brava! Ha! Well you could always print it out and pin it on their wall (then use it against them 😉 ). 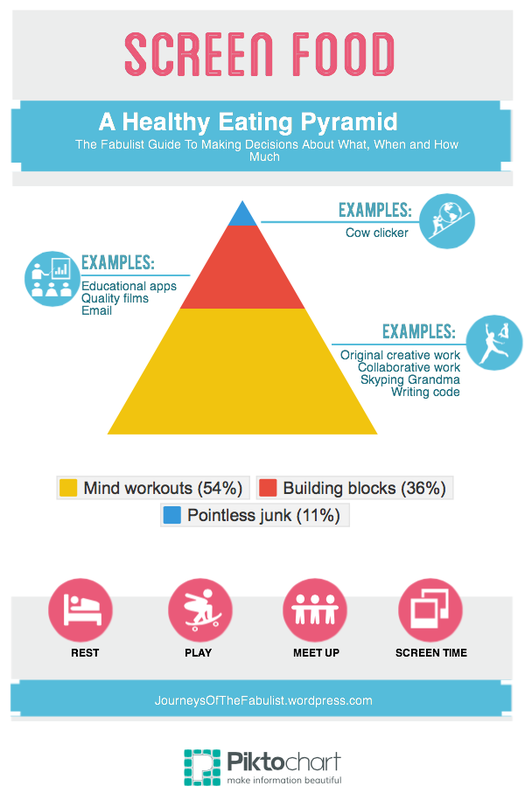 But it sounds like you’re already doing a pretty similar thing – classifying screen time as “junk” or “productive work” and making decisions accordingly (and in reality I’m sure most parents do this, it’s just we in this house are a bit clearer on what goes where now we have our infographic 🙂 ). I bet your boys get pretty good films. Any editing software they recommend? Yes please! We’ve been using FX Guru, but always on the lookout for more recommendations. Gives a wider range of tricks 🙂 . Love that pyramid! Not planning to show my son though as more negotiations about Minecraft will follow – “portion size” is already much debated, his view being you can never get enough! Yes, it doesn’t help when you can *agree* that mine craft is a lower-level activity but you *disagree* on the size of the pyramid, so to speak. Same problem with the food pyramid. You can’t just “buy” more chocolate by eating more broccoli and still avoid getting fat! At least he’s debating over something worthy, and not whether or not he can spend more time following the Kardashians more closely on twitter? Love to see what made it through the other side – they would have had great fun creating those! I’ll see if I can package them up for you tonight. Hehe. From the mouths of babes! That carer will be all over it by next week 🙂 . But the no curfew policy is interesting. We have agreed on a guideline of about 30min a day especially on their own (and it doesn’t need to be used every day 😉 ), more as a rule for us parents though. Another rule we have is no TV until after the day sleep/rest (unless Mum and dad are skyping to the other side of the world. Hence possible the positive attitude to skype?). Mostly because they have energy then so they might as well do something physical to use it up. More than 30 min is ok when we do something together with kids, even just look up animals on google from the other countries. But I like having kids think about the contents themselves! Obviously that has to be adjusted to the age but there is something I need to chew on for a bit. Ok, this is a reply to both the comments of yours above. First, yes – working with them and applying what they learned to other situations are both excellent work for the mind and a good way to load up the bottom of the pyramid. Good tips. And of course we like to know what they’re watching/doing as well. As for the curfews – I snuck in a slight admission somewhere that we do have a few curfew-like rules ourselves. For example, really and truly just don’t ask in the morning before I’ve had coffee (that wasn’t a joke). And P has to do his homework as top priority and we like to leave a gap before bedtime, etc. I guess we also have a vague rule-of-thumb about what a daily portion of screen time “should” look like, unless they’ve got an unusually good plan (the fact that the 3hrs of special effects stuff got the ok had a lot to do with the fact the activity involved plenty of stuff where they weren’t even looking at the screen). So yes, I think in reality the screen time pyramid ends up looking a lot like other people’s screen curfews, and maybe we just end up arriving from slightly different angles. But putting it this way allows us to explain why we’ll hand over our phones so they can spend 3hrs collaborating on home videos one day and just say no, not even ten minutes, no, to Angry Birds the next, without being inconsistent. Well, the explaining like this to them is new so I’m not sure how well that part goes yet 🙂 – but I think it works well for us, to give us more consistency and confidence, and kids pick up on that at some level, so I think from that angle it’s already better than what we were doing before, where the rules were more vague. I want to believe they will learn to understand the explanations later on and then be able to draw conclusions themselves, even if it still would be only hubbabubba. Time will tell, but at least there won’t be any harm done! True! No harm in trying on this one. I guess on principle we have tried to stick to is that if kids watch something on TV/ a new DVD, an adult watches with them. If they play, we try to play together. At least initially. Obviously to know what they talk about and that it really is suitable for our kids. Also to help them understand. But also because doing it together can help with creating the lowest level in your chart for young children. And then apps can be brought to the real world as well (I hope this teaches them how to apply information…?) e.g. we had an app with different forms and colours (and as we try to offer sources for 3 languages…) and then later on the kids drew the shapes and then we looked at them to figure out what they portrayed in our home/ surrounding (like a triangle can be the roof, a rectangular a door…). So of course our kids get screen time too, there are just not so many free but fun things to blog about 🙂 But it has been impressive also to see how a 3 yo figured out that counting 20+30 is like counting 2+3 and writing a 0 at the end. Even though she doesn’t know how to count to fifty yet. The one I chose to use the icon for in the middle-tier image is called Bridge – search bridge builder. I chose it because P has got so much out of it – you have to (well) build bridges, you get a certain budget, certain materials, and then you test the bridge using cars and trucks and if it’s strong enough you get paid. We use the free version. I can definitely recommend it. I’ll also recommend (free) Rail Maze and Toca Doctor, and FX Guru (as seen at the bottom). Pretty clever figuring out the 2+3/20+30 thing. Amazing what they can pick up, and sometimes presenting the information in an engaging way will definitely get them going. Oh yes, there are really good free apps out there! Have to check our your recommendations too! Also, if you get any good app recommendations, pass them along! I may have to start thinking in those lines and put together a post with the best ones! Well, Jen from At Three To Go said she was going to put together a post on what they’ve found, so it’d be great to see both sets of suggestions. If we got really organised we could rope a couple more in and cover an area each. Age 0-2, 2-3, or by subject area. Maybe age group is better because some apps give a diverse range of skills? I’ll get back to this when I’ve looked at them all and think back on what we’ve done. I haven’t been very systematical here. Age group sounds pretty good though. Yeah, same problem we have I think – trying to remember what was what. Maybe why a group effort is good because we can post about the here-and-now and get a broad cross-section of ages that way? Let’s hold this thought and get back to it! Yes, finding the time is a challenge. I’ll write it down on my master list of “things I should definitely blog about one day when I get around to it” 🙂 . Yes – hi from Grandma! I do really love your thoughtful blog post and infographic and I’ll talk to you anytime on skype. Honestly – great post – so proud. I’m thinking of sending you a few stickers. Can you handle that? Would also love to know more about the skeleton dance. We have a couple of similar videos that Nanny asked me about as well. I’m not sure everyone wants to see all of them, so I’ll just email a few to the Grandparents. Unfortunately, most of their work is lost to time as I forgot to show them how to save the videos after they’d made them, so they ended up making, watching, and then immediately destroying it – you won’t see too many props and costumes. This is fantastic Bronwyn. I love where WordPress is on the pyramid. Thank heavens I didn’t need to factor in all the variety of screens. The graphics you have created give me techno envy! It actually wasn’t too bad – the watermark at the bottom tells you the website I used (piktochart) and I started with one of their free templates and tweaked around from there. As with anything, it took some playing around to get used to, but it’s very accessible – anyone who can figure out wordpress could do it. Amazing the variety of free and easy-to-use tools we have online these days. I think I need some tutorials Bronwyn. You make it all seem so easy! No really – it’s just fiddling and learning. No harder than wordpress! I’ve never thought of you as a techno fear baby 🙂 . Thanks for the words of encouragement. I’ll have to do a post that requires a bit less technical learning next time, though. Those user-interface people are quiet geniuses and all, but the learning curve still took more time than usual. I can only imagine but now you have the skill. Perhaps in not fearful just a little hesitant to jump in at first. For a post, not for a learning curve. Less time compared to most learning curves. More time compared to most blog posts. 🙂 I knew what you meant. Oh, and do tell about how you guys made the skeleton dance movie. An app? My kids thought it was a hoot. It’s a rainy public holiday here in Hong Kong and we’ll need all the fun we can muster. It’s a free app called FX Guru. You get a certain number of effects for free and you can then empty your wallet on the rest, if inclined (hence the lengthy discussion about in-app marketing – although they don’t do it with pop-ups or anything, they do it using the fiendishly-sneaky method of offering a very inviting product, so I have to respect that). They really went nuts over it that first day I downloaded it. Now they use it from time to time. As always, I love your insight and appreciate your giving me so much else to read on the subject. 🙂 Now I am gonna go do something productive (like eat cookies, haha). Yeah, I think it makes a big difference what they’re using it for. Also, I think travel is a special circumstance where sometimes you’ve got to bend the rules a bit (I’m thinking more of planes etc than at the destination). I will say I found it hard to find “bottom-tier” activities for really young kids (say under two) so I can see how people might get the impression that they should spend less time with screens until they get to at least two or three. If Z used anything that got her creating directly when she was younger, it’d be good to know. There’s usually plenty of middle-tier stuff for even really young kids, though, and I’ve noticed it starts opening up from two/three years and above – as you’ve probably noticed as well. Enjoy your cookies 🙂 . You’ve got to have a treat from time to time. Whoa! I love your infographics! So aptly related to healthy eating pyramid. I guess most of us are guilty on the tip of the pyramid but I actually spend much more time on the 2nd tier with social connections and reading on information and other parents’ blogs. I don’t think I spend much at the bottom tier except that “producing original works” is referring to my own blog content. I like your no curfew stance. I have read the sentence on what you parents did about going out rules twice. Guess I will have to jot that down for the very near future teenage years of social interactions. Yes, I think we all struggle to keep it in balance – the junk food can be so tempting! And it’s hard to be productive (on that bottom tier) when you’ve got a lot of interruptions as well. I do think the curfew stance was a clever one. I remember at one stage hearing, “It doesn’t matter what I get up to as long as I’m home by ten.” That’s the last thing I want my kids thinking! Your parents seem open minded. I am not sure how much freedom I allow my kids to have. I’ll get the phone numbers of their friends. But that’s about all we can do isn’t it? They were and they weren’t. I actually thought they were more strict than my friend’s parents, but perhaps often in a different way. So no fixed curfew, but instead we got the third degree. They also had a habit of befriending the parents of my friends and would frequently let us know that we’d been seen around the neighbourhood by someone or other who’d reported back to them – spies everywhere! My kids are so young I haven’t really started thinking about it in too much detail, though – surely there must be something else we can do other than take phone numbers?? You’ll get there first – let me know! Your parents are so smart to lay spies everywhere lol! Ok, I will get there first, surely will be more than a few blog post on this. Plenty of material, I’m guessing. Oh I should clarify that the teen who said, “It doesn’t matter what I get up to..” was not anyone from our family! She was from a family who used fixed curfews. Obviously not the intended interpretation, but it was the one she used! Glad you clarify, you had me confused lol! This surely isn’t the right thinking we want them to have. It’s like giving them a total uncontrolled permission to stray! So my daughter’s Minecraft time is probably bottom-level mind building. My son’s Sesame Street is mid-level. And the time I spent screwing around with WordPress themes is junk level. Yes, I get caught with those themes, too. I think a certain amount of it is honing design sense and making you think about usability, but it very quickly gets into the “screwing around” category. Minecraft, on the other hand, is one of those games that can argue its way down to the bottom because you use a lot of creation/synthesis – just got to watch out for portion sizes (my big minecraft fear). 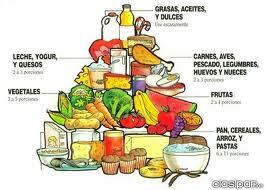 Love the comparison with the food pyramid, but really love the little sign that says Hi Grandma!!! Any time spent talking with grandkids belongs in the Building a Strong Foundation category!! I think both the kids’ grandmas would agree. Probably the granddads as well. This is hands down the best post I have ever read on this subject! The diet pyramid metaphor is fantastic and I love the way you added other bloggers ideas/guidelines. Congratulations! You should submit this to a larger publication. It needs to be read! Thanks 🙂 . I’m not sure where I’d start on the larger publications, especially now I’ve published it here. If you have any suggestions, let me know – I had to work on those infographics! This is a fantastic post. To quote a few old wisdoms : it ain’t what you do it’s the way that you do it. And Quality not quantity! The other part of this for me is what about the good stuff? Let’s not forget the good that we use it for. Yes! Definitely. We can use technology to our advantage, but we have to step back and ask what would serve our advantage first. Otherwise we end up just being led around by our smartphones.